Every Compustar system sold at Vickar Community Chevrolet includes a control module, or "brain" that safely integrates with your vehicle. Every Compustar system is built with Atmel processors for speed, efficiency, and performance. The #1 reason why Vickar Community Chevrolet love installing our products is that they are fully customizable. Regardless of your needs and/or vehicle, Compustar has a solution for you! With a Compustar Remote Starters remote starter, you won't need to sit in your car while it warms up. Vickar Community Chevrolet's remote starters will warm it for you. 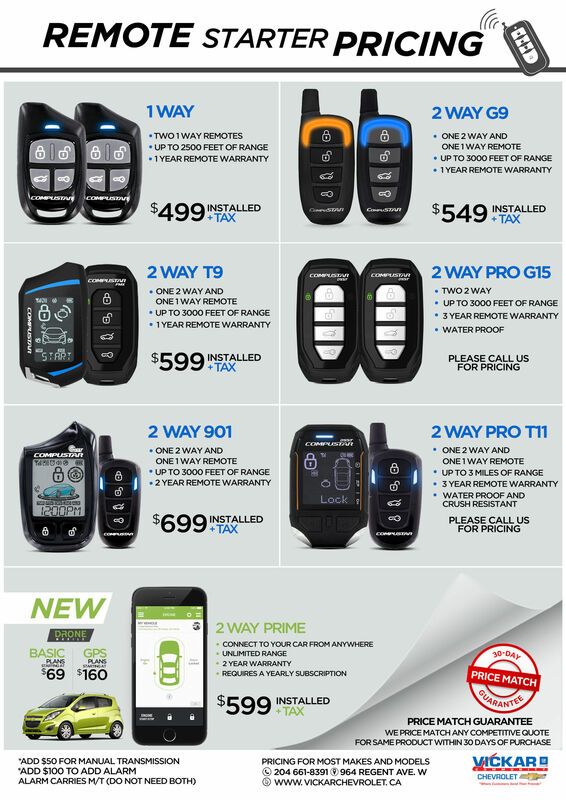 With many remote starters to choose from, we have selected these to get you started. Pick one of the remote starters below, and we'll install it for you. Vickar Community Chevrolet installs remote car starters for all makes and models. BMW's and other high end vehicles may require special kits.